Last week I wrote about how not to get inebriated at a large wine tasting event. I told you to drink water for every glass of wine, pour out, and that, though a party atmosphere, the goal isn’t to get drunk. Then, when a friend recounted a tale to me, of a recent wine tasting in her home and one of her guests getting completely wasted, I felt I had done a disservice. Why concern ourselves with our behavior at an event, and not as a guest in someone’s home? I’m beginning to think the latter…. is more important. So, with that said, and many of my friends reading this and silently chanting….oh yes, Eve is going to spill the beans on one of us. Rest assured. You know who you are. But, next time you come over I will be prepared. I regularly go to my sink, or your wine bar sink if you don’t give me a bucket, and pour out after I taste. Sometimes I pour out something I don’t care for, but when I have a dozen or more to get through, I may pour out every one. I still can’t believe that in all my years of drinking I’ve never supplied a bucket at my own dinner parties. And, when I had a wine tasting party for 75 guests in my home, benefitting my Unitarian Universalist church, we had a bucket at every station. All very tasteful and professional. I still have the buckets…but I never thought of pulling them out for smaller parties. Wow, just like that, there all the time, my blond brain is thinking ding ding ding! Ok, so that’s the bucket idea. The others, like water for wine, I have done. I put out water bottles when we are just hanging around my kitchen island watching my husband cook, and/or a carafe at the dining room table. And, if you still don’t know which one you are, take heed. Because the next time you’re here, or at anyone’s home that is reading this, the place of honor for you at the table will be: right next to the bucket. But at least the rest of us won’t have to worry about your “spillage”. 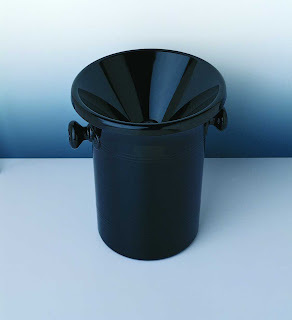 I love this bucket idea however, when I went to barparts.com I couldn't find this bucket. ?? Eve: You make me laugh so hard! But you are right! It is never appropriate to get drunk at anyone's home – or anywhere really. Even if the wine is 'free', moderation – and dumping – is always a better idea. I always have dump buckets available when I do wine tastings, and I know that my guests appreciate it. Thank you! Thank you! I don't know why I couldn't find it, it was before food and shower, that's it! I think the idea of having something like a "pour-out bucket" at home events is a brilliant one. And somebody is going to make a mint marketing these for home use! …but I think there has to be a more appealing term than "pour out bucket".